I woke up with a feeling that I slept really well but when I looked at the time it was still only just after midnight. I had in fact been asleep for only 3 or 4 hours but I felt surprisingly refreshed. It was still too early to be getting up though, so after I finally managed to nod back of again I was woken by the sound of my fellow ohenro-san getting his things together. He was behind schedule because the time was coming up to 04:30 and he had planned to be gone by 3 o'clock but it wasn't long before he got his things together and was gone. Alone again, I picked up where I had left of last night and finished writing my notes and then managed to fall asleep again for an hour before getting up and getting myself ready. I went out and and prayed at the main hall and decided I should get a stamp put into my book. The stamp like every other temple was 300 yen and that I thought could at least contribute towards my stay in the tsuyado last night. The man in the stamp office did it slowly and deliberately and unlike the other temples I received 3 rather than the standard 2 temple slips. During the first pilgrimage, along with the stamp I received a small piece of paper with an illustration of the temple deity. During this pilgrimage I was getting the small piece of paper but it was accompanied by a red coloured one to commemorate the 1200th anniversary celebrations. Toyogabashi (#8) had three very different looking slips including one depicting Kukai resting under the bridge. Miyoshi-san had not known too much about this Toyogabashi (#8) but he had definitely liked it very much so I decided to get a stamp for him too. I asked the man if he could do the stamp on a separate piece of paper and he retrieved a pile that had already been prepared and gave me one of those along with the 3 temple slips. My plan was to send the stamp along with a photograph of Miyoshi-san sitting in front of the altar in the main hall after I got home. Miyoshi-san didn't know I had photographed him in the main hall and I hoped the surprise would remind him of the temple and also of our meeting. Before heading on there was another important place to visit and that was the spot under the bridge. The last time I had been here it had given me kind of goose bumps at the thought that Kukai himself had slept at or very near the spot I had been standing. Under the bridge were two reclining statues of Kukai and I stood and prayed in front of one of them. As I did so, several pigeons perched themselves along the length of the statue. When I had finished my short prayer I decided to deal with the pigeons because they were obviously after something to eat. I took out my emergency dorayaki and shared half of it with the pigeons. They could at least eat the spongy part while I finished of the sweet bean paste middle. I bowed one last time and then slowly walked up the opposite set of steps and on towards my first stop, the huge supermarket just a few minutes walk from Toyogahashi (#8). Like I had done last time I bought the exact same food and stood and ate it outside and when I was done I continued on at a very slow leisurely pace. The plan today was to go as far as a Sennin-yado Daishido and the total distance was going to be only about 20km again. The weather was a bit cloudy but the temperature was very comfortable for walking. I had left quite early but I had planned to take a few long breaks and hopefully arrive around 3:30. However, before I could really get myself and my thoughts into gear, what I really fancied was a hot coffee and my first opportunity came up quite quickly when I spotted a Lawson. I got my coffee and dorayaki and ate it outside and while I stood there I figured I'd might as well print of a few more photographs. I ended up printing 33 more and while I was placing them in the clear plastic sleeves I noticed a customer watching what I was doing so I handed him one with nothing more than a nod. I also gave one each to the staff before heading out. The route today was pretty easy and all I had to do for the first couple of hours was follow Route 56 towards Uchiko. I continued at a slow steady pace and like last time what I really liked was the landscape. After stopping for drink break outside the Yamazaki Shop I followed the arrows away from Route 56 through into a small residential area and then onto a muddy track which brought me to a sports ground. I stopped briefly to watch a schoolboys baseball game for a few minutes and then headed on to a large very green looking pond which I remembered from last time. The pond was home to a pair of black swans and whether they were the same pair from last time or not I wasn't sure but I was waiting for them to emerge from their little floating hut so I could photograph them. As I was doing this I looked up and from my right I saw Beno and Susanne coming towards me with big smiles on their faces. I had last seen them several days ago on the way back from Kongofukuji (#38). They both looked fit and well and after exchanging a few updates we calculated that we might bump into each other again at Furuiwayaso tomorrow. They had booked themselves to stay there and I was planning to just use the hot spa and then sleep outside. With that they continued on and after I had done taking photographs I continued following the arrows. The arrows led me along Uchiko Antique Street which had been preserved in the architectural style of a few hundred years ago. It was lined with lots of small shops and although I had no idea what it did look like a few hundred years ago it was certainly very pretty and there were plenty of places along the way to stop and eat. My plan however, was to get to Uchiko Fresh Park Karan. The last time I had stopped there I had enjoyed an interesting ice cream combination. The flavours were not the usual boring rum raisin, strawberry or vanilla type flavours. Last time I had tried a ginger and mountain potato combination. When I arrived at Uchiko Fresh Park Karan I found a busy market going on and after getting through the throngs of people I got myself a double ice cream cone. This time it was a black sesame and wheat flavoured combination. 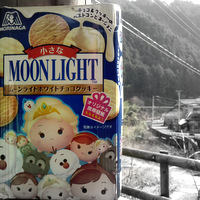 I headed to a nice little seating area nearby overlooking a small river and sat myself down to enjoy my treat. I ended up spending a whole hour just relaxing and enjoying the sunshine. Thinking the pilgrimage was becoming a little too easy a sudden jab of pain in my leg reminded me that it also had a few hardships too. I decided to give my leg a bit of sun and when I pulled my trouser leg up I noticed it had swelled again. The worst part of it was that part of the swelling seemed to resemble the consistency of soft dough. I gently rubbed some Tiger Balm on the painful part and took a couple of pain killers. After a while it seemed to feel a lot better and although it was not really hindering my progress in anyway, I finally dragged myself away just after midday. As I was getting ready to leave a man asked if it was OK to sit at my table which of course it was and so he sat down with his young daughter in his arms. She averted her gaze and kept looking down. When I was ready to leave I held out a photograph for her but she didn't make a move until her father told her to take it. I then held out a candy and that she took without any prompting at all. The sunshine was definitely a lot stronger that it had been when I arrived to enjoy my ice cream and I would overhear later that the temperatures had been in the low to mid twenties. I kept up a very slow pace and stopped whenever I felt like taking photographs or stopping to enjoy the scenery. I was on Route 379 and the route twisted and turned with the twists and turns in the Oda River. The scenery was extraordinarily pretty with small clusters of homes located along and overlooking the sides of the river. The prettiest place I found was undoubtedly around a place called Ose. The trail deviated away from Route 379 and followed a smaller parallel street which was punctuated at each end by extremely nice rest huts. I stopped at the first rest hut and it felt great just sitting there looking down at the river and enjoying the general surroundings. As I continued on through one of these diversions from the main road a couple of very young girls greeted me so I gave them each a piece of candy and continued on my way. About a minute later they came racing up behind and presented me with a small box of chocolate cookies. I had seen them come out of a house when I met them so I assumed an adult had suggested they give me something. Whatever the circumstances it was incredibly sweet. They really seemed to want me to have the cookies and although it felt like I was taking their treat in the end I reluctantly accepted and said thank you. 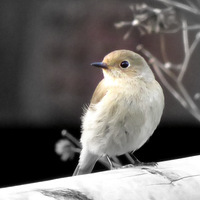 However, before letting them race away again, I gave each of them a photograph. A little earlier on the way to Uchiko Fresh Park Karan I had phoned Sennin-yado Daishido and had been told it would be no problem to stay there. The place was supposed to be somewhere a little further on from where I received the osettai from the little girls, so I paid extra attention to my guide book and my surroundings. 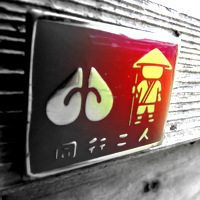 I spotted a small faded handwritten signboard with details of what I believed were directions to Sennin-yado Daishido. Sadly I seemed to miss it and had continued going. When I came to a tunnel I definitely knew I had gone too far so I called Sennin-yado Daishido and told the man where I was and he confirmed what I already knew, that I had gone too far. He asked if I would return and initially I said yes but after walking back the way I had come, I looked in my guidebook again and with it being just 3 o'clock and plenty of daylight left I figured I could press on to the next small town and camp in a hut which Hagimori-san had told me about. I called Sennin-yado Daishido and told the man that I had decided to press on instead. I felt a bit annoyed with myself but I told myself everything would be fine and the hut was just 5km away or about an hour or so if I picked up the pace a little. After passing through the Yoshinogawa Tunnel I spotted a very different hut and it looked big enough to easily accommodate my tent, it was overlooking a river and there were a couple of homes not too far away. I had enough snacks but no water but about 200m ahead I could see some vending machines so after getting some water from the vending machines returned to the hut. The hut turned out to be one I had seen in online posts and not only was it quite big it had a separate wooden construction with a shower in it. I quickly set up my tent and ended up having a quick cold shower. It was cold but quite bearable because the sun was still shining and the water was not as cold as it could have been. I actually felt great after my quick cold shower. In fact it was almost as if the hut had found me rather than me finding the hut. If I had stayed at the Sennin-yado Daishido I would not have had the chance to shower so it turned out to be great. With everything arranged in my tent I was just enjoying the surroundings when a car pulled up and a man and woman got out. They looked like a couple out on a date and I initially thought I had invaded a space where they maybe sat and chatted. However, after greeting them and chatting to them I discovered their were no romantic undertones to their stopping by the hut, they had in fact stopped near to the hut to pay their respects at the family grave which was situated away to my right up the side of a hill. Before they went away though I gave the woman all the photographs and told her to choose one she liked. There were a lot of photographs so it took her a while to choose one see liked. There seemed to be two she really liked and both were of flowers so I told her she could have them both. When they returned from paying their respects the man stopped by the hut to wish me luck and to tell me to take care. I was at the Uchiko ohenro hut and I was really happy that even after the mix up over missing Sennin-yado Daishido everything had worked out nicely again. It was still too early to settle down for the evening but I got into my tent to keep myself warm. Today had been another very gentle and very relaxing sort of a day with nothing more difficult than putting one foot slowly in front of the other, enjoying some strange ice cream combinations and handing out photographs to random people. The unhurried pace was what I realized was making the biggest difference to how I was experiencing my second ohenro. The scenery all along the way had been great but the highlight was definitely the two young girls holding out the small box of cookies for me. Tomorrow I planned to visit Daihoji (#44) and Iwayaji (#45), stop at Furuiwayaso for a soak and hopefully meet Beno and Susanne again.